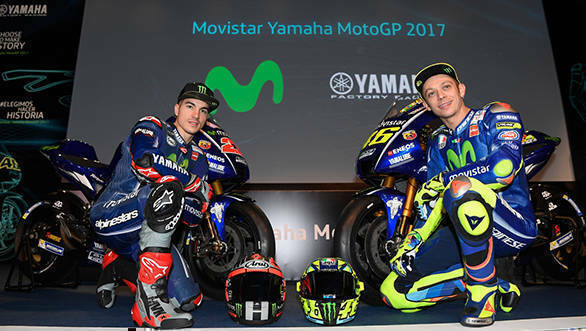 The Movistar Yamaha MotoGP Team unveiled the new 2017 YZR-M1 and the rider line up at a glittering ceremony in Madrid, Spain. The event was held at the Telefonica Movistar headquarters and the 2017 team was presented by Kouichi Tsuji, general manager of Motorsports Division, Lin Jarvis, managing director of Yamaha Motor Racing and Massimo Meregalli, the team director. Joining MotoGP legend Valentino Rossi this year is Maverick Vinales who was recruited after long standing team mate Jorge Lorenzo moved to the factory Ducati team. This was the first official presentation of the year, with more to follow before the first official pre-season tests begins at the Sepang International Circuit in Malaysia on January 30, 2017. The new M1 features new livery with a different shade of blue that's more in line with the production bikes, the YZF-R6 and the YZF-R1. The lines are cleaner with an even more prominent Movistar logo adorning the fairing. 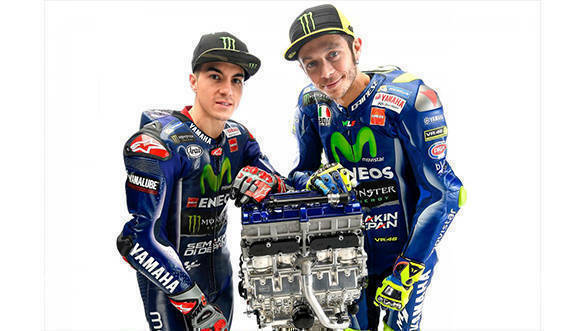 Speaking at the ceremony, nine-time world champion Valentino Rossi said that he is happy that the new season is about to begin and that he missed riding his bike. He also stated that he is looking forward to the first test session as it will allow the team to benchmark itself against rivals. Rossi has been is good form over the last three seasons, that he finished at the runner's up spot and he is hoping to clinch his 10th world title this year. Maverick Vinales was quite pleased with the reception he's had at the team. He called it a family-feel as he's gelled well with his new team. He was also excited to be part of the team launch, having watched Rossi on the M1, when he was a kid. "It's like a dream come true. The bike looks so beautiful, I wish I could start riding it right now!" 2017 will be Vinales' third season in the premier class and going by his impressive performance on the factory Suzuki bike, in the last couple of seasons, a lot is expected of him. 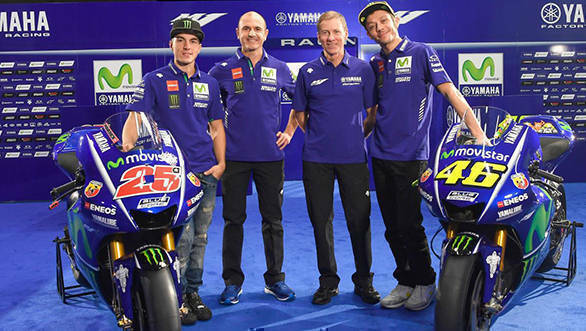 Lin Jarvis, managing director, Yamaha Motor Racing said, "Over the last three years we have demonstrated that our team is very competitive and our partnership with Movistar has delivered great results on and off the track. We see today not only as the official start of the 2017 season but also the start of a next chapter with our exciting new rider line-up; it is a new beginning and so Movistar's slogan "We Choose to Make History" is certainly very fitting and one we will strive to live up to."